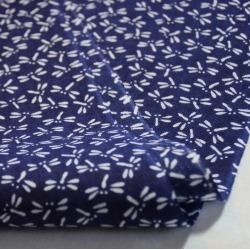 Tenugui is a rectangular cotton fabric put on the head to practice the Kendo. It is a multi-purpose fabric. Tenugui There are 55 products. 世渡りの極意 -Yowatari no Gokui Cotton 100% Size: 36 x 90cm Tenugui is a multipurpose Japanese traditional towel used in kendo, for cooking and in a wide variety of areas. It is also a simple and original gift. You can wrap it around the neck or wear it on the head when practicing Kendo. 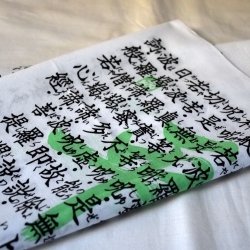 般若心経/ 平常心　緑 Tenugui Hannya Shin Kyo ( Buddhist sutra) Green-Heijyoshin Cotton 100% Size: 36 x 90cm Tenugui is a multipurpose Japanese traditional towel used in kendo, for cooking and in a wide variety of areas. It is also a simple and original gift. You can wrap it around the neck or wear it on the head when practicing Kendo. 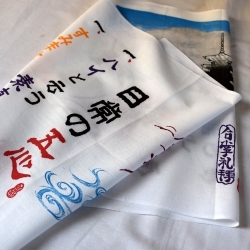 Nichijo No 5 (go) shin Cotton 100% Size: 36 x 90cm Tenugui is a multipurpose Japanese traditional towel used in kendo, for cooking and in a wide variety of areas. It is also a simple and original gift. You can wrap it around the neck or wear it on the head when practicing Kendo. 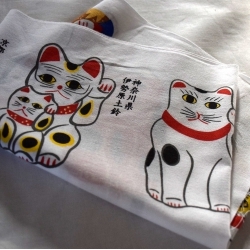 Tenugui 招き猫 Maneki Neko (Lucky Cat) Cotton 100% Size: 36 x 90cm Tenugui is a multipurpose Japanese traditional towel used in kendo, for cooking and in a wide variety of areas. It is also a simple and original gift. You can wrap it around the neck or wear it on the head when practicing Kendo. 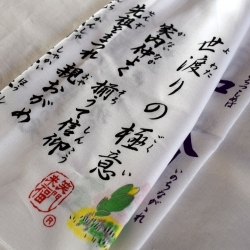 Tenugui "Kenko jusshu" / 10 rules to be healthy Cotton 100% Size: 36 x 90cm Tenugui is a multipurpose Japanese traditional towel used in kendo, for cooking and in a wide variety of areas. It is also a simple and original gift. You can wrap it around the neck or wear it on the head when practicing Kendo. 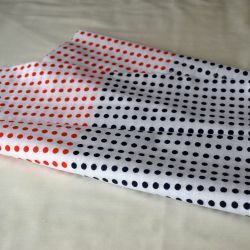 Tenugui Mame (Pea) Shibori Red and Blue Cotton 100% Size: 36 x 90cm Tenugui is a multipurpose Japanese traditional towel used in kendo, for cooking and in a wide variety of areas. It is also a simple and original gift. You can wrap it around the neck or wear it on the head when practicing Kendo. 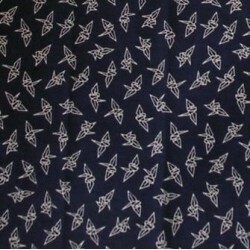 Tenugui Origami Tsuru (crane) Size: 36 x 90cmCotton 100% Tenugui is a multipurpose Japanese traditional towel used in kendo, for cooking and in a wide variety of areas. It is also a simple and original gift. 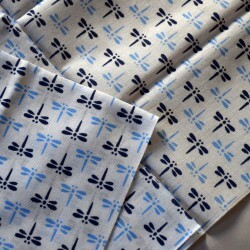 Tenugui Tombo - (Dragonfly) Dark Blue Size: 36 x 90cm Cotton 100% Tenugui is a multipurpose Japanese traditional towel used in kendo, for cooking and in a wide variety of areas. It is also a simple and original gift. 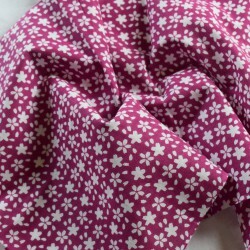 Tenugui Sakura - Cherry pink Cotton 100% Size: 36 x 90cm Tenugui is a Japanese traditional towel. 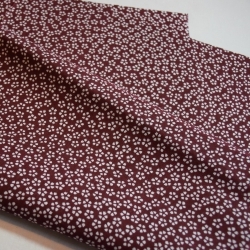 It is made of cotton fabric of plain weave. 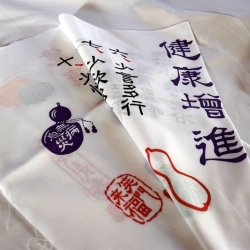 Tenugui Tombo (Dragonfly) - White Cotton 100% Size: 36 x 90cm Tenugui is a multipurpose Japanese traditional towel used in kendo, for cooking and in a wide variety of areas. It is also a simple and original gift. You can wrap it around the neck or wear it on the head when practicing Kendo. 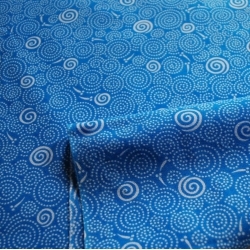 Tenugui Medaka (Japanese small fish) - Blue Size: 36 x 90cm Cotton 100% Tenugui is a multipurpose Japanese traditional towel used in kendo, for cooking and in a wide variety of areas. It is also a simple and original gift. You can wrap it around the neck or wear it on the head when practicing Kendo.